Amoretti's Natural Lemon Zest Oil Extract adds a brightness to your pasta no matter what sauce you intend to pair it with. Adding another extract of your choice will only enhance the flavor and open your palate to some pretty amazing flavor combinations. 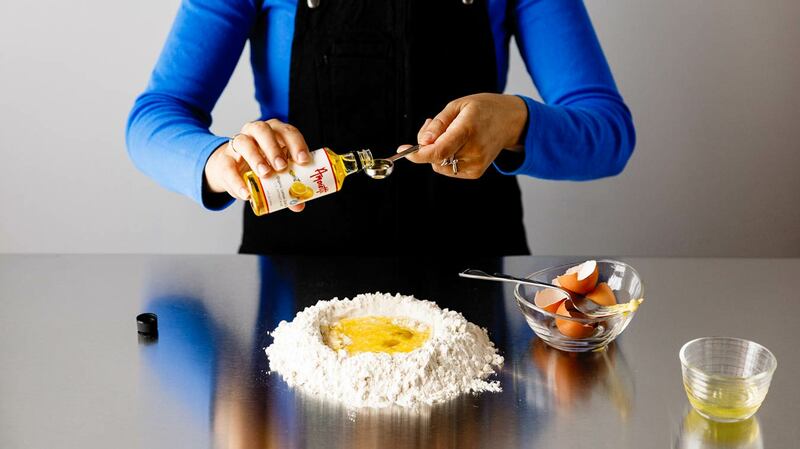 For some traditional Italian dishes, ½ tsp Basil Oil Extract is the perfect pairing. 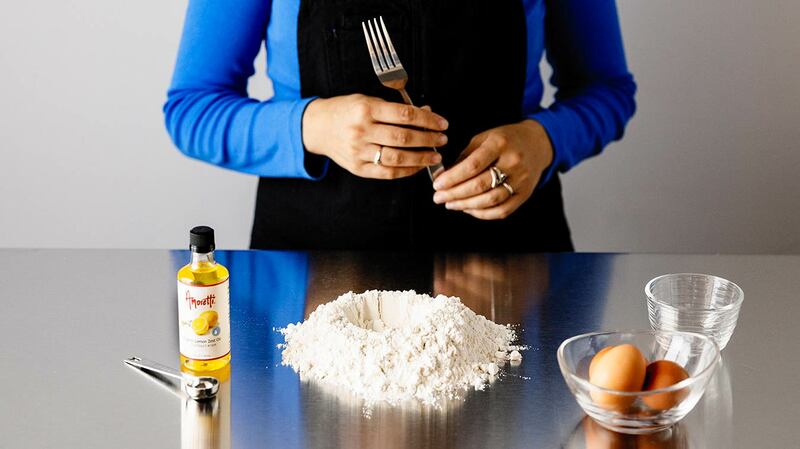 For light seafood pastas, Fennel Extract adds a depth that truly compliments all white fish. A carbonara would exceed your expectations with the addition of 1 tsp Natural Ham Hock (Roasted Ham) Type Extract. Or add ¼ tsp Nutmeg Extract to a rich butternut squash ravioli. Makes about 1lb pasta dough. 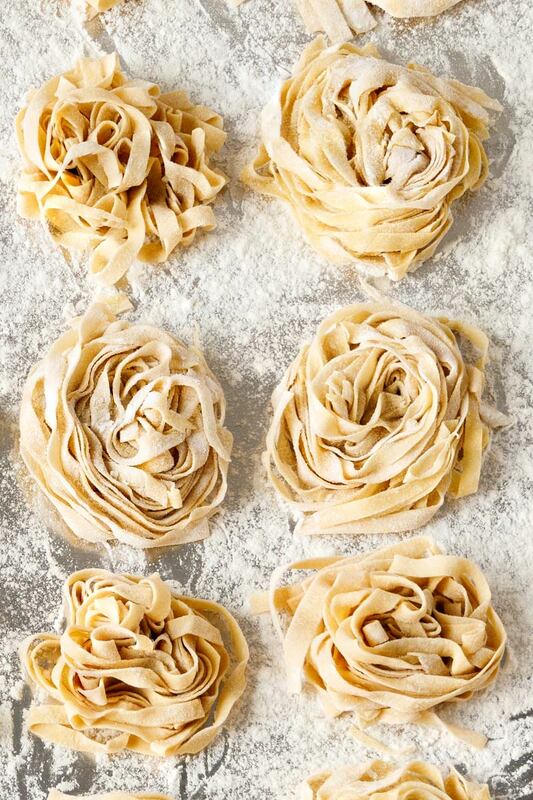 What ideas do you have for creating a delectable pasta dish? Let us know in the comments below! Everything we need for homemade pasta! Yup, that's it: flour, eggs, and Natural Lemon Zest Oil Extract. And a fork. Or dive straight in with your hands for bonus Nonna points. Crack those eggs into the flour well. Give it a quick stir to break up the yolks. It's flavor time! Just 1 teaspoon of our Natural Lemon Zest Oil Extract will give your pasta lovely fresh flavor, or swap in whatever extract is burning a hole in your cupboard at the moment. Slowly stir in the flour until the dough starts to come together. You're almost there! Use your hands to mix in just enough flour for the dough to be nice and stop sticking so much. You probably won't need all the flour, just push it off the the side for now. 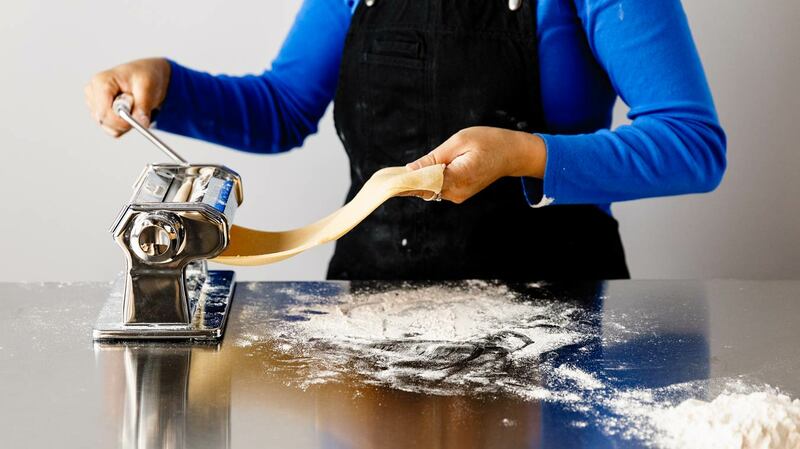 Knead your pasta dough for a few minutes until it's lovely and smooth. Feel free to sprinkle in a little more flour here if you need it. Time to break out the pasta machine! (Or kick it old school with a rolling pin and get in a serious arm workout.) A light dusting of flour helps everything move smoothly as we roll our way to the finish line. 1 tsp Amoretti® Natural Lemon Zest Oil Extract O.S. Place the flour on a smooth counter in a large pile. Make a deep well in the center of it. Put all remaining ingredients into the well. 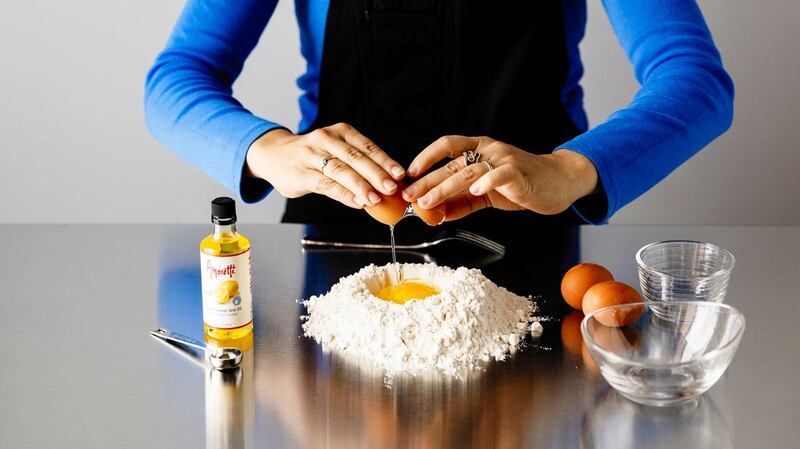 Using a fork, pierce the yolks and gently begin to stir the eggs and extract(s). 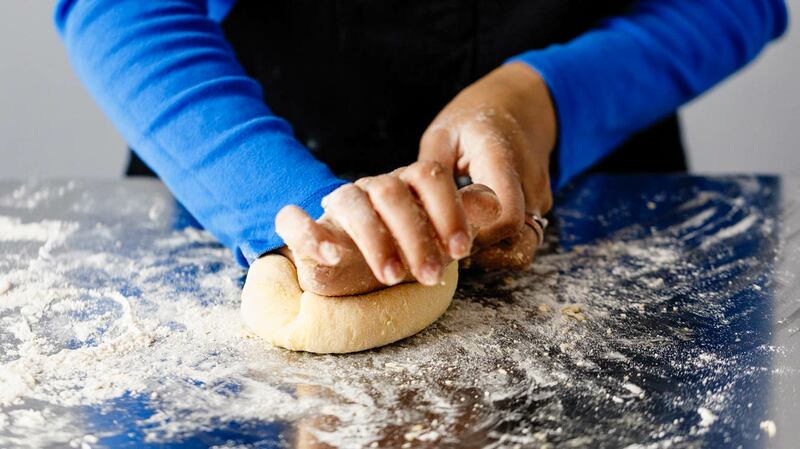 As the dough begins to come together, begin to knead more flour in with your hands. Not all the flour will be used and that is okay. 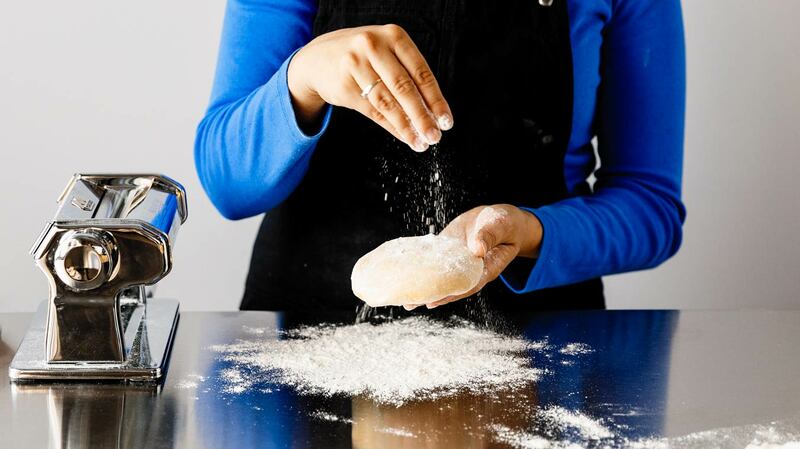 Knead the dough for a few minutes until it is uniform in texture and color, adding small amounts of flour if it begins to stick to the work surface. Cut the dough into two or three pieces, be sure to cover the unused dough with plastic wrap so that it will not dry out. Take your piece of dough and flatten it out with your hands to about half an inch thick. Dust with a bit of flour. Set your pasta roller to the widest setting and roll the pasta through that setting, fold in in half and roll it through once more, now one more time (this strengthens the gluten). Click to the next width setting, run it through once then fold over and roll it through one more time. Go to each consecutive size down and roll it through one time. The final thickness depends on what it is you will be making. 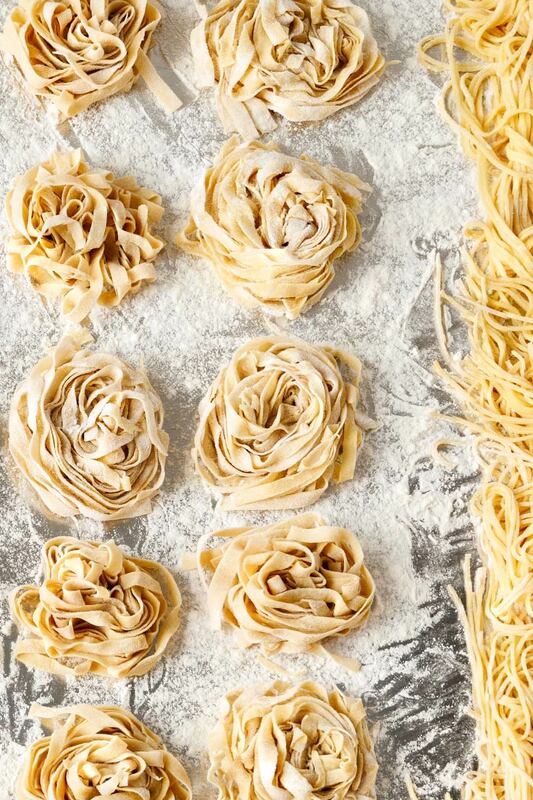 An agnolotti, pappardelle, ravioli or a lasagna sheet will go much thinner than spaghetti. The pasta can be cooked immediately to your desired doneness, keep in mind that fresh pasta cooks very quickly and the time truly depends on the final thickness. Just stay close and test a piece after about 2 minutes. You could also dry it out for future use. This is a great idea for all non-filled pastas. Toss it in flour on a flat surface and let air dry for a minimum of 12 hours up to 24 hours. Why “00” flour? This type of flour is the most refined type of flour made. That enables the pasta to have a silkier texture and will have great texture once cooked. It will have “bite” after being boiled and wont start to disintegrate. The next best flour to use would be all purpose flour. What about semolina? This is used as well to make pasta and is very common. It is a much coarser grain and the kneading process is a bit more difficult to work with because not as much gluten will develop as you work it. It will, however, give a much heartier texture to the final product. So... when to use which flour? They are interchangeable. When testing out different recipes we discovered our preference: we like to use “00” flour when making ravioli, agnolotti, tortelloni, or any other pastas that use a filling or may be very thin. The elasticity that we get from “00” flour helps it get super thin without tearing or crumbling. 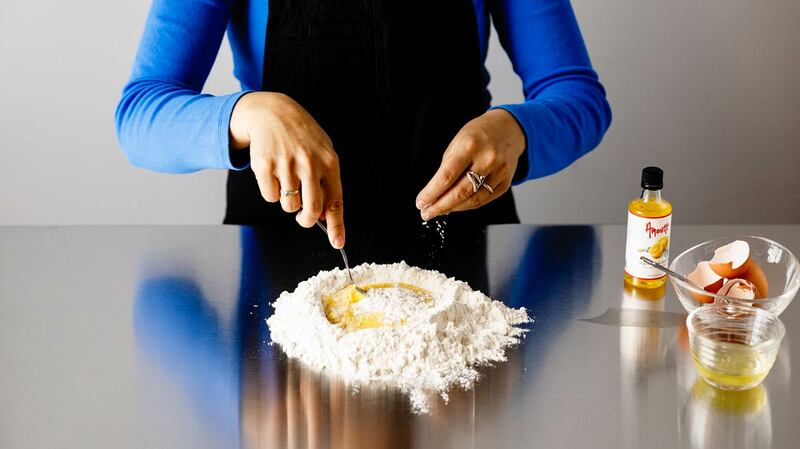 We use semolina for pasta types such as spaghetti, linguini, lasagna sheets, macaroni, and penne. These pastas are less delicate and are generally thicker. Again, that happens to be our preference, try it out for yourself! If you have fresh pasta left over and you do not store it for long term use (freezing or drying) it may look like it has brown speckles after sitting in the refrigerator overnight. Do not be alarmed! It is perfectly fine, you may hold on to it for a few days, it just won’t be as pretty. 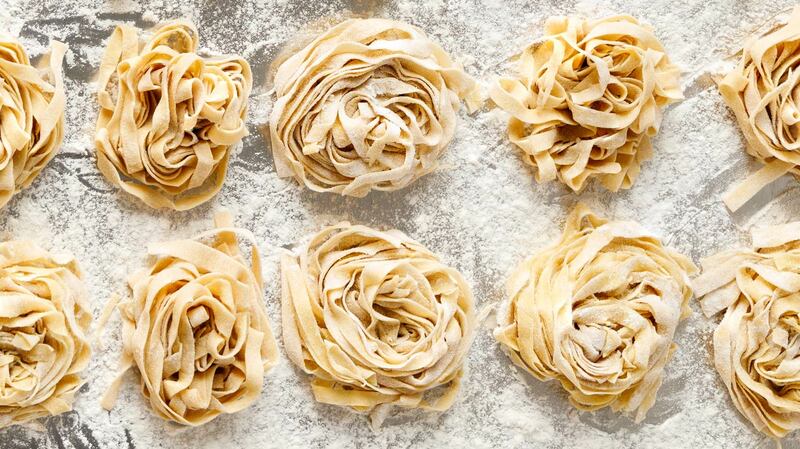 Fresh pasta can be frozen and will last for months! 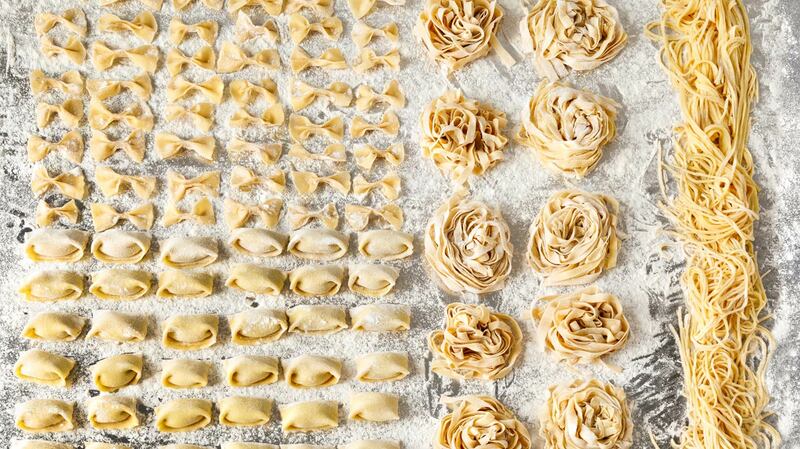 This is a great idea for the filled pastas such as tortelloni, ravioli or agnolotti. 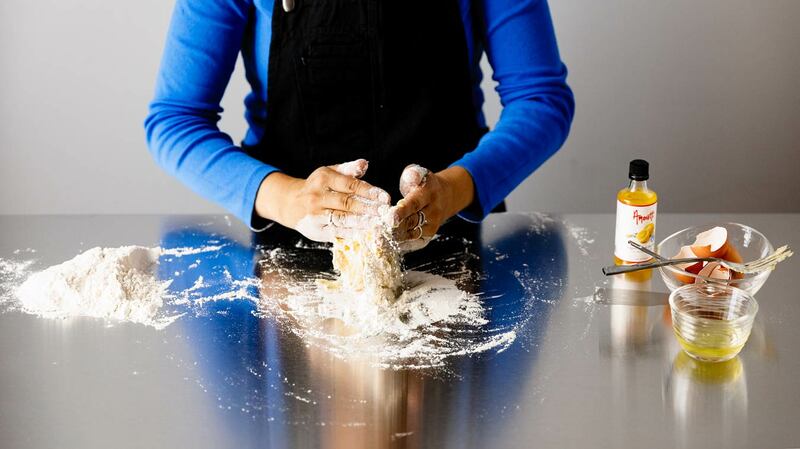 Toss some extra flour on it and freeze your pasta on a flat surface before consolidating into a bag or container.